Search engine optimization is essential to increase your targeted traffic. Once you know "how to optimize a website" and "implement the seo tactics" the traffic for your website will increase. If you have a new website, it is like a new born baby, and adequate attention has to be shown inorder for the website to grow well among the other established websites. On-Page optimization is very crucial to make the websites rank for a particular keyword/keyword phrase. On-page optimization and off-page optimization are formidable wings of website optimization. To get good ranking in google and other major searchengines, on-page and off-page optimization have to be carried out simultaneously. This is a "rule of thumb." Google gives foremost importance to back links. Backlinks can be campared to votes a politician gains in an election, if more people votes on him, higher is the success percentage to win the election. Google counts on the number of backlinks aswell as the importance of the backlinks. The importance of the backlinks are guaged by the page rank the websites are holding. Gaining more back links through directories, search engines, classifieds sites, social bookmarking sites, forums, articles, blogs, writing reviews etc. have to be started right away from the inception of a website. On-page optimization is making the path easier for the spider to index a page and to make them understand which keywords you would like to rank for a webpage. Once you analyse and understand "what are the targeted keywords for your website" and by optimizing for those keyword can I "improve the intended conversions" for my website, which can make me tall high among the competition. To know whether prospect will visit my website, the keywords have to be chosen wisely. There are wise tools which can tell you which are the keywords people are using as a "search query" most of the times when they browse through the search engines. You can very well target those keywords for your website, but the issue here is high search volume keywords often have high competition. Do you think a website can easily rank for this tuff keyword? I meant keywords having high volume and high competition? Yes, you can rank for this difficult keywords within 5 to 6 months time once you establish your sites with long tail keywords surrounding the target keywords. Most importantly find and optimize keywords with high search volume and low competition, doing this can make you rank quickly and attract more traffic. Start doing keyword research with excellent tools like google keyword suggestion tool, WordTracker and SEO book. Title plays a formidable role in on-page optimization technique. Having your target keywords in the title should be you first step in on-page optimization process. A strong Title is like an efficient sales representative for your webpage. A visitor finding your website in search engine result pages would consider your title for making a decision whether to step inside your webpage or not. So be wise to write a title to your webpage. A snippet of information appearing on search engine result pages beneath the webpage title. Meta description tag should be well utilized to make the searchers understand in short about the webpage. Meta descriptionsassist webpage titles in pulling the prospects to the webpages. Have your target keywords in H1 and H2 tags. Search engines give good amount of importance to H1 tags. Keep your keywords in your images. This would help the search engines and bilnd persons to understand what the image is all about. Take your actions now to optimize a new website and reap your benefits. Be patient, don't be in a hurry, lay down a strong foundation with perfect on-page optimization and off-page optimization. You will be rewarded within few months of time. Examples of potential test pages could be your homepage or a product detail page. Create and publish different versions of your test page at unique URLs so that Website Optimizer can randomly display different versions to your users. These URLs could be bookmarked by your users, so after your experiment finishes, you may want to keep these URLs valid. This is an existing page on your website which users reach after they've completed a successful conversion. For example, this might be the page displayed after a user completes a purchase, signs up for a newsletter, or fills out a contact form. Google will provide a link to the installation and validation instructions for you to send to your team. You'll be able to check on the status by returning to this page. You should be comfortable with basic HTML editing, have access to your web pages, and be able to upload the tagged pages to your server. Congratulations! All your pages have been validated and you are ready to continue to preview and launch your experiment. Add the control script to your original pagePaste the following at the beginning of your original page's source code. Paste the following at the end of your original page's source code. Add tracking script to each pagePaste the following at the very end of all (1) of your variation pages' source code. Add the tracking script to your conversion pagePaste the following at the very end of your conversion page's source code. Supplemental index was introduced in 2003, to differentiate it from the rest of the results. The pages which falls in to supplemental index seldom ranks, shown rarely in SERPs. Supplemental pages made the webmasters/SEO understand that they need attention to get them out of the supplemental index and to gain a place in the index document. Google clearly labelled the supplemental pages, once necessary work is done to those pages to bring them out of the supplemental pages, google removes the label and keep them in normal results. Google came up with a major update on July 31 2007 to remove supplemental label and to unite it with normal results. Now webmasters/SEO confront the issue of finding out which are the supplementary pages, eventhough the label has been removed the qualities and ranking nature remain the same for supplemental pages. On Dec 18 2007 google has assured justice for supplemental results by eliminating the distinction between "supplemental pages" and "normal pages." Now we're coming to the next major milestone in the elimination of the artificial difference between indices: rather than searching some part of our index in more depth for obscure queries, we're now searching the whole index for every query. From a user perspective, this means that you'll be seeing more relevant documents and a much deeper slice of the web, especially for non-English queries. For webmasters, this means that good-quality pages that were less visible in our index are more likely to come up for queries. Writing a query with allintitle: will fetch you the webpages containing the all of the query in the title. Site:www.domainname.com query modifier assits website owners to know "how many of their website pages have got indexed in a search engine." For instance, [ site:www.online-businesssolutions.com] will find pages within www.online-businesssolutions.com that have got indexed in search engines. Submitting video sitemap to google will make your video urls gain a place in google video. 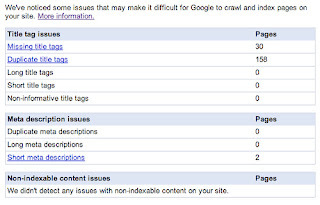 Google has added "content analysis" feature to webmaster tools. Now website owners have a very simple and easy wasy to find out the missing titles, duplicate titles, missing meta description, duplicate meta description, problematic meta description, pages containing non indexable content viz. flash, videos etc. Once a request for a file is placed, google uses first party cookies to track the various traffic metrics and send those back to the google analytics server. Read more about How Google Analytics work. Once a request for a file is placed with the server through a browser by a visitor, the server supplies the file to the browser making the request. At the same time, the browser may also send requests to other servers which has hosted parts of this page. This is where google analytics server comes in to picture. The browser request the code form the analytics server and the server nods it head by sending the GATC to visitors browser embedded inside the file name Urchin.js. As soon as the browser gets the code through Urchin.js, the code will start identifying and collecting the required matrics and sets a no: of cookies and it is sent back to google analytics server. Webpage "Title" is one of the most crucial factors for a search engine to understand the importance of a page with respect to the search query. Studies say the visitors make out what the page is all about only by reading the title of the pages, so title of webpages has to be constructed very carefully and no two pages in the same domains should have similar titles, unless that is unavoidable in some cases. Webpage title is like a sales man for a particular page, carefully crafted web page titles work well in making the visitors understand about the page by just glancing at the title. Visitors do not wish to spend more time to go through the entire page to infer the writing, instead they look for the titles for speedy answers to know where they are standing now. Search engine optimization is about creating a smooth road for the search engine spiders to travel and reach the destination. Social media optimization is about eliminating the compound walls so that the content can be freely distributed and shared by the community. Social media sites has provided website owners with a way to get rich traffic to their websites, than relying solely on search engines. Google analytics completed its successful march for two years. Even then Google analytics is free! “If you surveyed FTSE 100 companies and asked them whether they were using analytics data to drive business decisions a lot of respondents would say ‘Eh? What’s web analytics?’, even though they had a product and were paying a lot of money for it. Google Adwords announced template center for MCC. From now on users of MCC can manage and create templates for their clients linked from MCC account. Google doesn't allow adwords users to have more than one display url sharing the same top level domain for a search query in SERPs. But of late there is a delay in validating display urls sharing the same top level domains. This could be a granted opportunity for affiliates advertising for the same organisation. Creating a new website and driving targeted traffic to the site within a few days is almost impossible. PPC search engines are handy in these situations. Bidding for keywords and paying for every click in the ad will drive targeted traffic to your websites. The experts in ppc can help you in setting things up and paving way for your prospects to check in. The best PPC engines are Google Adwords and Yahoo Search Marketing. Contact adwords consultant for a discussion.